Quebec chef Chuck Hughes has won the epic TV food battle, Iron Chef America, beating out his heavyweight competitor with a plate of lobster poutine. The Montreal cooking show host was the second Canadian and first Quebecer to "reign supreme," as they say on the show, which aired Sunday night on Food Network Canada. Hughes beat out Bobby Flay, one of the show's resident culinary masters, in the kitchen stadium battle, which featured the secret ingredient — Canadian lobster. With his two sous-chefs from his Old Montreal restaurant, Garde-Manger, at his side, Hughes whipped up a multi-course menu in an hour that wowed the panel of judges. "This really is a dream come true for me. It was one of the most intense challenges of my life, and I'm so proud and honoured to represent Quebec and Canada," said Hughes in a statement released Monday morning. Having lobster as a surprise ingredient didn't hurt. Hughes likes the crustacean so much that he has a picture of one tattooed on his arm, along with shrimp, pie and bacon. "I actually kind of knew exactly where we were going to go with it, so it was kind of a perfect-case scenario," he said. Vancouver's Rob Feenie was the first Canadian chef to win the series in 2005. Other Canadian chefs who've battled but lost on the series, a spinoff of a Japanese cult hit, include Michael Smith and Lynn Crawford. Hughes — who focuses on simple comfort food at Garde-Manger — said he was asked to be on the series last year and accepted because "it's a once-in-a-lifetime thing. You're not going to be invited again." 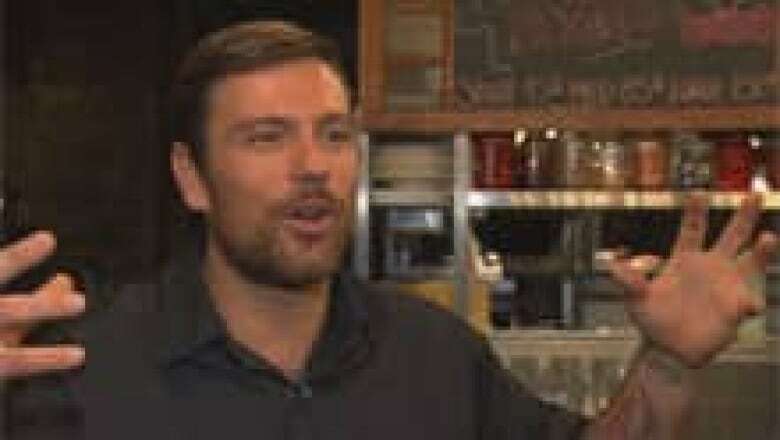 Chuck Hughes, 34, hosts his cooking show, Chuck's Day Off, from his Old Montreal restaurant, Garde-Manger. (CBC)New York-born Flay was his first choice to compete against, even though no Canadian chef had beaten the guru of southwestern cuisine on the series before. Toronto's Susur Lee tied Flay in 2006. The program involving Hughes was recorded last July in New York City. Though they had previously brainstormed on which dishes would work with virtually any secret ingredient (ravioli and risotto were among their ideas), they weren't married to their concepts, said Hughes. "That whole month prior was a disaster mentally. We were breaking down a lot. It is just hard when you think about it. It feels like your whole life, your whole body of work is judged," Hughes told CBC in an interview last week. "It's pushed me outside of my comfort zone to learn more, and to be better and better myself. That is the whole goal of cooking." Before entering the kitchen stadium studio, Hughes met all the Iron Chef America personalities backstage and spent about 10 minutes alone with Flay. "When I met him I said, 'Hi Bobby,' and my voice cracked a bit and I gave him an official [Montreal] Canadiens jersey, to which he replied, 'Thank you so much — but it's not going to help,"' Hughes said with a laugh. "He was very polite and very nice and he gave me some great words of encouragement, and not necessarily for the battle, but mostly for life." 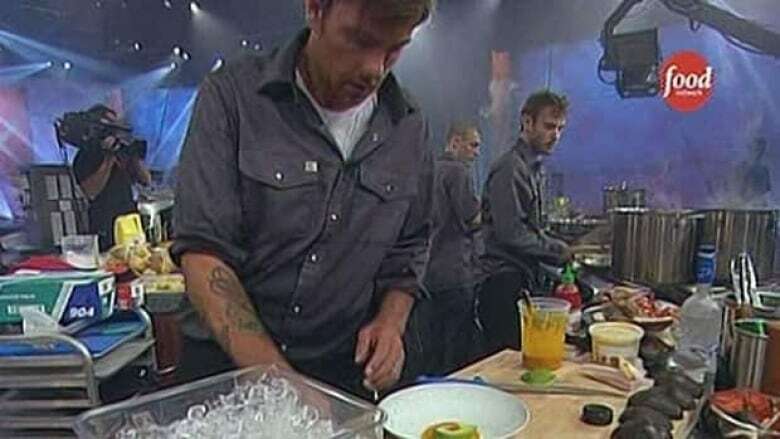 Hughes said he was very vocal during the challenge, talking to the cameras and the show's commentators as he cooked. "They're like, 'Is this guy for real? He never shuts up,"' he said with a laugh, noting he was "yelling in French" at one point. "I'm thinking they're going to keep a little bit of the French in the show. I'm hoping because it's going to give it that special Québécois feel." Hughes's own cooking show, Chuck's Day Off, has earned him a following around the world. The show airs on Food Network Canada and is distributed to broadcasters around the world. He said his experience shows how being passionate and working hard can pay off. "My take on it is that anybody can cook. You have to want it," he said. "I am not special. I went to school. I worked in restaurants. I cut an unbelievable amount of potatoes."